That night, as the winds howled through your branches, I lay shuddering in my hut, warm and dry under the protection of your forebears. As the tropical rains washed the silt from your roots and ripped you away, I listened to the insistent drip, drip, drip; the heavens had violated my peace. Now you lie isolated at the end of civilisation, preserved, like an ancient King, by the salty current that licks your wounds. Your leaves no longer breathe life to the world, your fruit no longer give nourishment to those struggling families who relied on you. You have been forgotten by all but the plants and birds who find momentary shelter in your tangled roots. Your branches have long since been torn away by the repetitive tide. Your colour has seeped into the vast blue ocean. As I age, time will smooth away your wrinkles, slowly demolishing your softened features and, many years after I have gone, every inch of your being will be broken down and re-distributed. You will (as is nature's way) once again bring life. 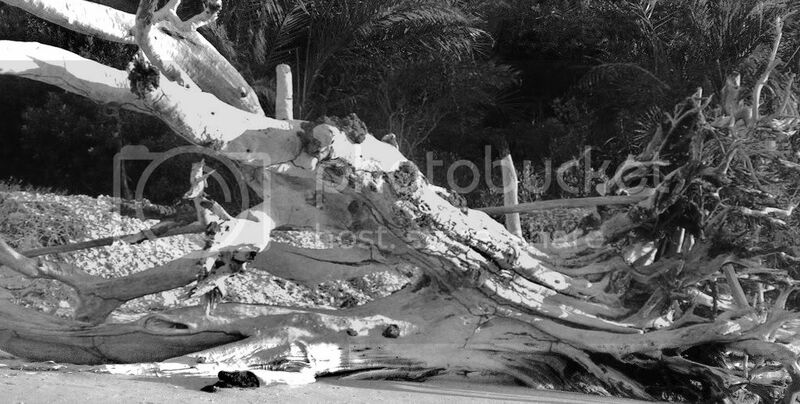 This picture was taken on the Mozambique coast which is regularly transformed by devastating tropical storms. This post was written for this week's Gallery at Sticky Fingers.